When I am asked what my favorite part of working with Georgia Master Gardener Extension Volunteers (MGEVs) is, I proceed to express how much I enjoy visiting Master Gardener projects around the state. I don’t just praise the beautiful demonstration gardens overflowing with colors, scents, and learning opportunities, thousands of pounds of fresh produce donated annually from community gardens, or the ways young minds marvel at the fruits of their labor carefully cupped in their hands as they squat between rows of vegetables and herbs in their school’s garden. I share my joy for the ways in which Master Gardeners impact communities as they touch and change the lives of those around them through volunteer service. There is such value in witnessing the work of MGEVs and the relationships they build with community members. 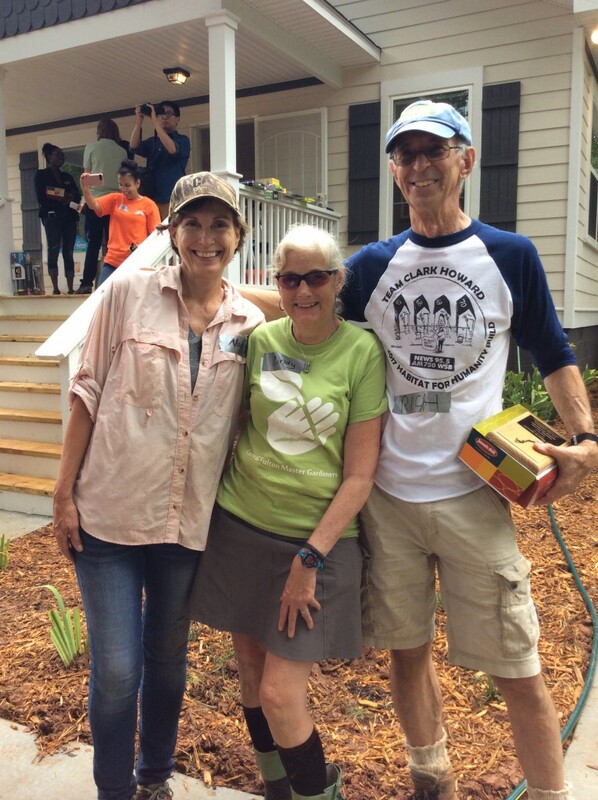 The work of Central Fulton Master Gardeners (CFMGs) with Atlanta Habitat for Humanity (AHH) is a shining example of the powerful, meaningful, and lasting impact MGEVs have on their community members. 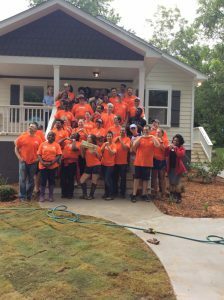 Since 2009, AHH and CFMGs have embraced their missions of building and growing communities as they joined forces to improve Atlanta neighborhoods. Master Gardeners lead the landscaping phase of new home construction, and they have taken on this leadership role with enthusiasm. CFMGs function as skilled supervisors and educators to the homeowners and to a team of volunteers. MGEV responsibilities include conducting a site analysis and selecting plants appropriate for the site. Plant material is purchased from Frank Smith Nursery in Chamblee, GA. CFMGs use helpful tools they created, budget worksheets and plant pallet guides with recommendations for plant material that thrives in the site’s environmental conditions, to guide the purchasing process. On the workday, MGEVs educate and direct volunteers by explaining appropriate methods of planting trees, shrubs, perennials, and sod. They also teach the new homeowner how to properly maintain the landscape surrounding their new home, and they return after the homeowner has settled in to conduct a follow-up visit. The Home Depot IT Department volunteers pose for a photo. e landscape surrounding her home, the 300th AHH house! Not only did all in attendance of the house dedication following the completion of the landscape installation witness the presentation of the home to Ms. Pitts, but CFMGs were also awarded with a plaque in recognition of their dedication to assisting AHH in making adequate and affordable housing available to citizens of Atlanta. It was inspiring to witness the homeowner beam with pride and overflow with appreciation as a crowd of volunteers joined her in rejoicing and celebrating the gift of place to call home. This informal ceremony illustrated the scope of the positive impact Master Gardeners have. 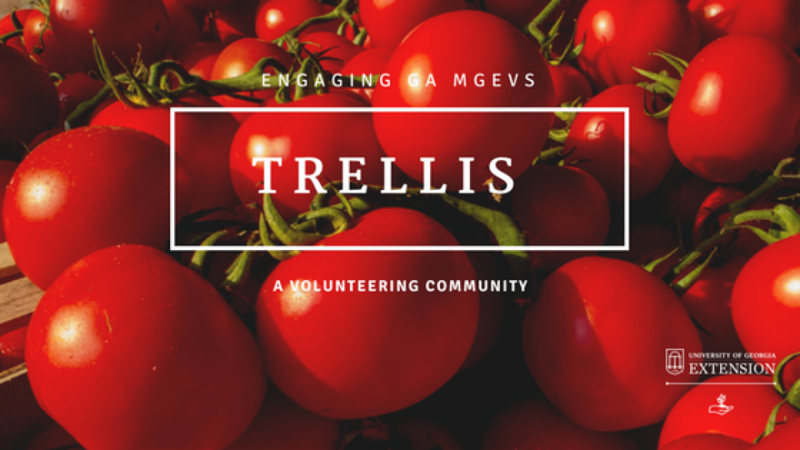 MGEVs use their horticulture expertise and volunteer leadership and management skillsets to give those in their community, not just houses, but homes with manageable landscapes and the knowledge to care for them. CFMG Association President, Al Olszewski, describes volunteer work with Habitat for Humanity as gratifying. As I drove away from the 300th Atlanta Habitat for Humanity build, I was full of gratitude for the opportunity to witness the appreciation for what MGEVs do in their communities. With the completion of the 300th house, CFMGs continue on full speed ahead, completing 35-50 homes each year and volunteering over 1,000 hours with AHH each year. To learn more about Central Fulton Master Gardeners go here. To learn more about Atlanta Habitat for Humanity, volunteer opportunities, and donation opportunities, go here. Posted in Projects, Volunteering. This entry was tagged central fulton master gardeners, habitat for humanity. Bookmark the permalink.